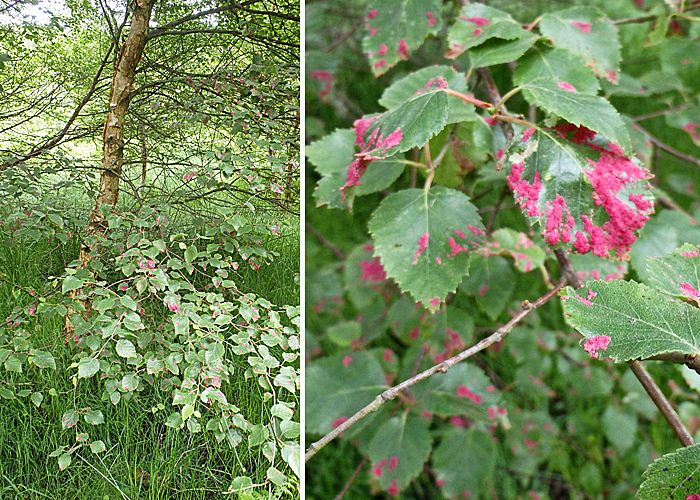 Whilst collecting with other Club members at a freshwater site in Yorkshire we noticed a tree with some very distinctive pink areas in the leaves. We identified the tree as a birch and collected a few of the leaves. 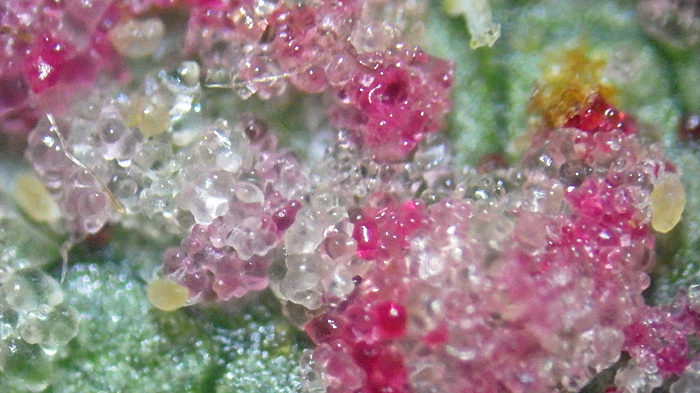 I later examined one of the leaves with a stereomicroscope and found the pink deposit was a mass of small spheres and amongst them were some very small arthropods. We investigated the Internet and decided that the pink deposit was a gall. A little more delving indicated that it was an erineum gall caused by eriophyid mites. 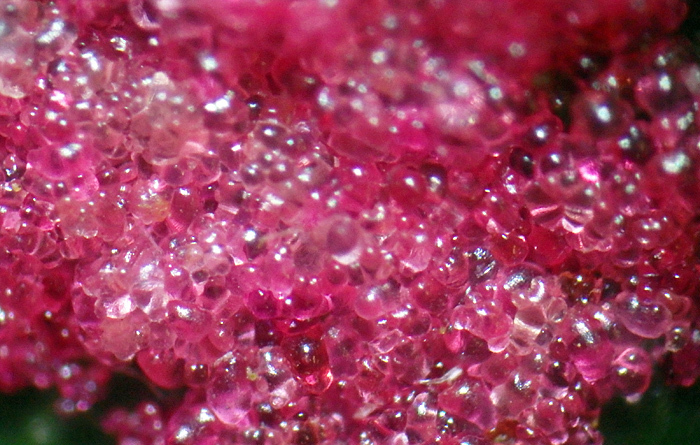 The pink deposit seemed to be a mass of pink ‘bubbles’ on stalks and I removed one and mounted it in glycerine to view it at higher power (approximately ×200) in transmitted light. I have subsequently got more information on these galls; interestingly most is from Internet sites describing the gall in the USA. However, eventually I found that the galls had been identified in Britain at Thorne Moor in Yorkshire in 2011 and at Messingham which is near Scunthorpe. The description at Messingham indicates that the mite is Acalitus longisetosus (Birch mite gall Acalitus longisetosus). There is a bit more information at Leaf Galls on Maple — Department of Entomology — Penn State University, including a sketch of a mite. 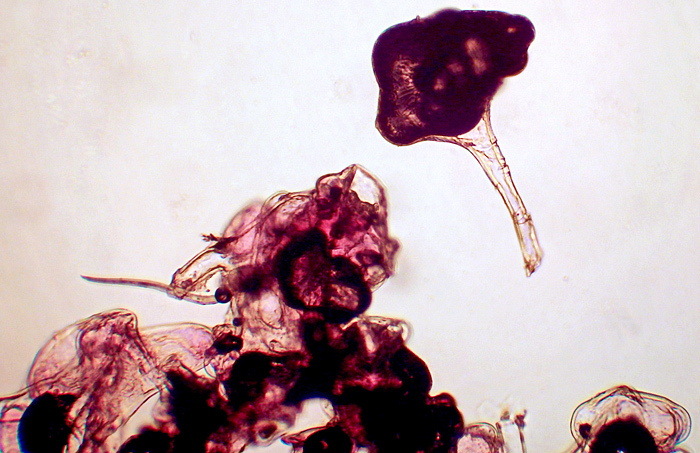 A description of the mite is at Velvet galls caused by tiny eriophyid mites | MSU Extension. This type of mite is less than 1/100 of an inch, cigar-shaped, and though it is related to spiders and spider mites (which have eight legs), the eriophyid mite has only two pairs of legs. Because the tiny mite is hard to observe except under magnification, it is usually identified by the strange growth response it causes on the host plant.